Alison, you are an amazing advocate for children with dyslexia, mentoring teachers to teach structured literacy methods like Wilson Reading, an excellent expert to assess students (LDTC), a true leader in teaching and mentoring, a brilliant person, and most of all…a person who has dedicated her life to making a positive difference in so many peoples’ lives. Thank you for all of your work and endless dedication to the cause. I live in Texas. My grandson is 24 years old and has been tested to be at a third grade level in reading. He is unable to find a job. He is denied due to his inability to read. There are no services available where he is currently living. He lives day to day on the money he can earn around town doing odd jobs. He has recently been turned down again for employment at 4 places. Does dyslexia qualify under the ADA? These are excellent articles to inspire students with learning dis-abilities! Thank you!?? I am so pleased to see momentum in the areas of providing resources and valuable information to teaching professionals and parents about dyslexia. Alison Pankowski, you are an amazing advocate for dyslexic children and you should feel proud of all you have accomplished. As president of the Learning Disabilities Assoc. 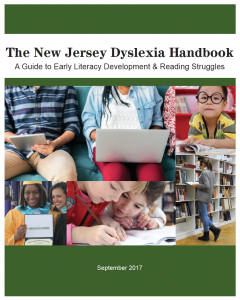 of NJ and a participant of the group that created the NJ Dyslexia Handbook , I couldn’t agree more about the importance of educating parents and professionals about Dyslexia and other Learning Disabilities so that students are evaluated as early as possible and receive appropriate instruction to meet their needs.